As a student of martial arts for over 20 years, I can definitively say that Krav Maga is the most complete system that I have encountered. This is not to imply that Krav Maga will make a student invincible, nor does it imply that other systems and martial arts are inferior – it’s just that Krav Maga is the complete system – for me. Having studied many other martial arts from childhood (Tae Kwon Do) into early adulthood and beyond (Chinese systems, boxing), I finally found a ‘style’ or system that I truly believed in, that truly was more martial than art. Krav Maga incorporates many things from other styles and looks to build upon that knowledge to offer an extremely well rounded system that anyone can truly pick up and try. Krav Maga covers defensive tactics (de-escalation, avoidance techniques, smart decisions), combatives (as found in other systems like Boxing, Muay Thai, Karate, Tae Kwon Do), groundwork (you don’t want to fight on the ground, we want to get up as quickly as possible) and restraint (think Ju Jitsu/Aikido/BJJ). Other streams other than the civilian version offer military, police and personal protection training. This can involve firearms training, anti-terror techniques, riot control, law enforcement and control – there is a reason why many law enforcement agencies around the world use Krav Maga training and techniques as part of their all round training programs. Krav Maga isn’t steeped in centuries old tradition, forms and rituals. The techniques taught are effective, they are proven and more importantly, they are continually being revised and improved upon as knowledge is garnered about new scenarios and results under extreme stress. The beauty of Krav Maga is the efficiency in which it bases it’s principles – there are no ‘hidden techniques’ reserved for ‘closed door students’, nor are there secret and mystical strikes that would strike you dead 3 days after the blow has been delivered. 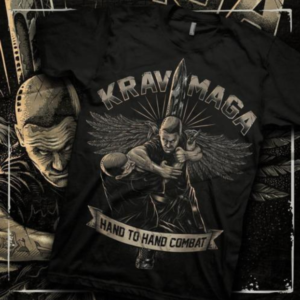 To be concise, Krav Maga is the defensive (and sometimes offensive) action taken to prevent harm coming to an individual with combatives and technqiues designed to deliver maximum impact across multiple target areas. I’ve heard it described as ‘spreading the pain’ – delivering straight punches, hooks, low leg kicks, knees, elbows and finger strikes to intended targets with retzev (continuous motion). My advice to any martial artist would be to train hard in your chosen style, but always look to improve on what is offered. The combative arts are forever evolving and improving and scienctific research and real world experience enables professionals to incorporate those findings in better training methods, better ways to gain strength and endurance and sometimes better ways to deliver that knock out punch or strike. To delve into a Bruce Lee tangent, absorb what is useful.